November 30th saw the latest gathering of cooking club 'Culamis'. Guided by our skillful and inspiring master chef Ron, we again had a terrific evening of cooking and enjoying great food and excellent wines. 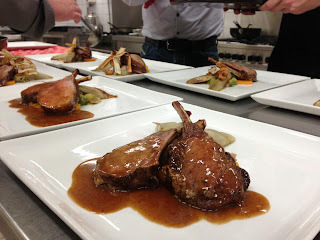 The main course of the evening was 'Rack of wild boar', with braised chicory, butternut squash, salsify, haricots verts and a demi glace of boar. This was served with a Gratin Dauphinois, a classic French potato side dish with cream, garlic and cheese. Here's some pictures of the evening to give you an impression of the atmosphere and, of course, the recipe. Thanks to Lars, for the pictures! Remove the meat from your fridge at least one hour before cooking so it can get to room temperature. Rub lightly with some olive oil and season with salt and pepper. Pre-heat a large frying pan over high heat. Add butter and mild olive oil. Do not use extra vierge olive oil, it will burn. 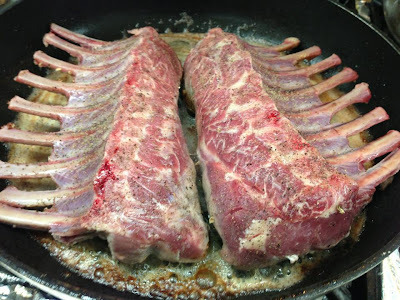 Sear the meat on all sides over high heat until nicely brown on all sides, max 7-8 minutes. Remove from the pan and keep aside. Remove bitter core and outer leaves from the chicory. Add to a pan with 2 cm of water and a small knob of butter. Cover with some butter paper to prevent oxidation and simmer gently until soft throughout. Remove from the pan and drain off any excess water. Scrub the salsify thoroughly and peel. Using a potato peeler, cut into thin, long strips lengthwise. Deep fry in hot oil until light brown and crisp. Sprinkle lightly with salt and keep aside. Peel butternut squash and remove core. Cut into 1/2 cm thick slices and into nice round shapes using a cookie cutter. Cook until tender in water with some butter, salt and a pinch of sugar. When ready, remove from the water and keep warm. Clean haricots verts. Have ready a large bowl of ice water. In a large pan, bring 5 liters of water to a rolling boil. Add 1 tbsp of salt. Quickly blanch your beans (2-5 min max), making sure they are cooked but still firm. Using a slotted spoon, quickly move them to the ice water. Leave until cool throughout and remove from the water. 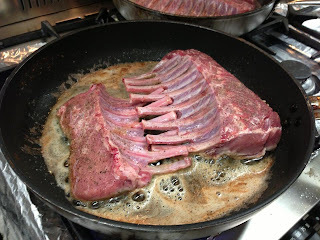 To Discover Great Taste, use the beef glace recipe on this blog, using bones, skin and meat from the young boar. Alternatively you can use your favorite dark sauce recipe. Simmer your sauce until almost right thickness and concentration. Move the rack of wild boar to a baking dish. In an oven at 130°C, leave to roast until the core temperature of the meat is exactly 60°C. Remove the meat from the oven and leave to rest for 5 minutes, lightly covered in aluminium foil. Cut the chicory length wise. Saute in a little butter, and season with salt, pepper and 1 tbsp of sugar. Cook for a few minutes until the sugar has nicely caramelized. Likewise saute your beans but do not use sugar. Remove your sauce from the fire and quickly whisk through a few smal knobs of cold butter (approx. 30 gr (1tbsp) of butter to 125ml or half a cup of sauce). This will thicken your sauce to an unctuous, lustrous end result. This technique is called 'Monter au beurre' in French cuisine. Arrange vegetables and meat on a nice big plate. Cover lightly with a little sauce (serve remaining sauce in a seperate dish). Use salify as garnish on top. green beans and of course fresh pesto. As desert 'Ron's Banana Split' with hand made ice cream. 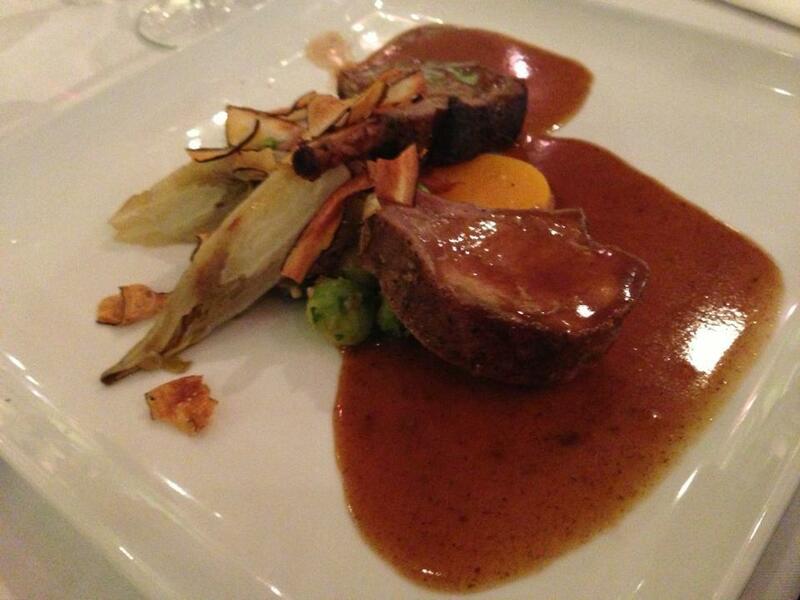 Even though this is young boar, the meat is much gamier than pork. Due to that stronger flavor, it needs a complex and bold wine. 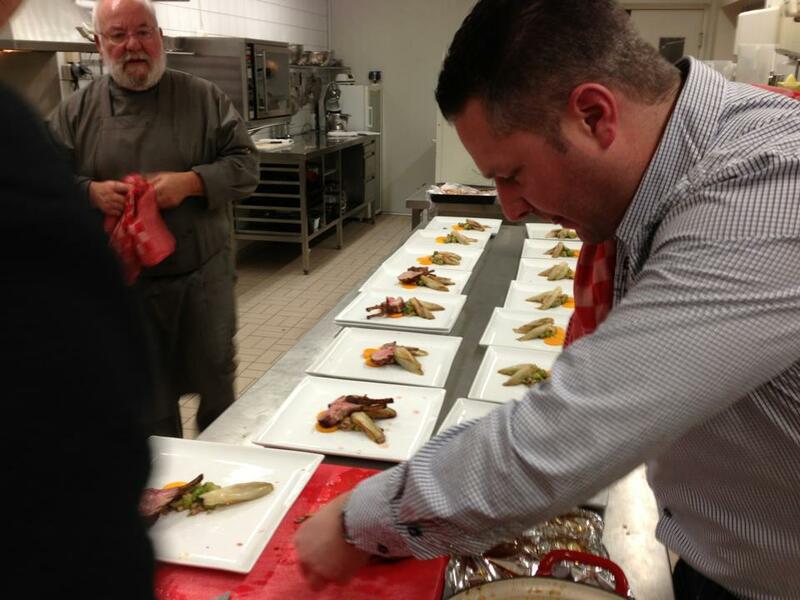 As the boar is also very lean, it needs to be served quite rare or otherwise it could go dry. Therefore, a rich and tannic red wine with complexity and dark fruits is best. Barolo, Barbaresco, Cabernet Sauvgnon and Super Tuscans would do great. Our choice for the evening was a Ripasso 2009 Valpolicella Superiore DOC from Viviani. A fruity and complex ripasso with a wonderful cherry aroma that went very well with the entire dish.